Allcry ransomware uses sophisticated techniques to infiltrate computers and hide from its victims. Use Reimage to determine whether your system is infected and prevent the loss of your files. Allcry virus functions as a new file-encrypting threat which specifically attempts to infect Korean, Chinese computer users. 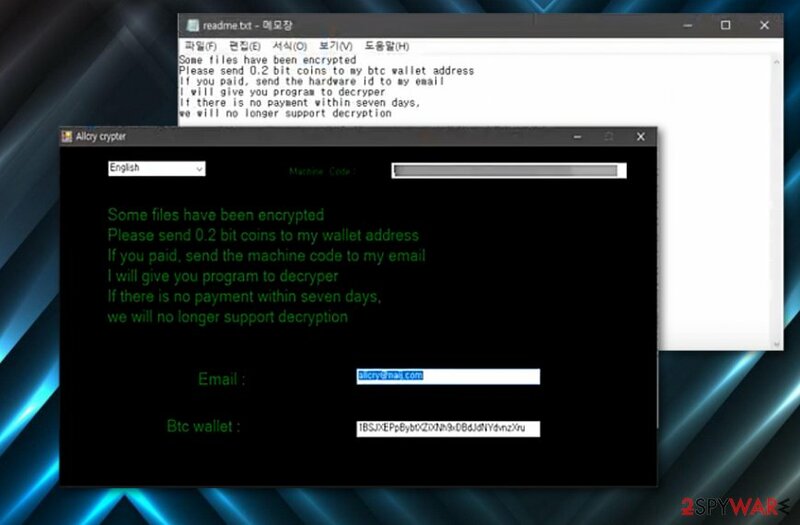 It presents its readme.txt message in English, though users can opt for Chinese or Korean in the ransomware interface. Besides the mentioned text file, the malware functions via its executable allcry.exe file. The ransomware seems to be still under development. However, it is not recommended to remit the payment as the perpetrators do not give you any guarantees about returning the data. Instead, concentrate on Allcry removal. Reimage or Plumbytes Anti-MalwareMalwarebytes Malwarebytes will come in handy in this situation. Allcry ransomware appears in a couple of different versions, which can be distinguished by the email address presented to the victims. Currently known versions are using allcrys@naij.com or allcry@mail.com. Though the malware appends .allcry extension which clearly refers to the notorious WannaCry menace, it happens to be one of the multiple viruses which tend to scare victims more rather than posesses real technical capacity. Likewise, Allcry malware joins the family of fake crypto-malware. Even though it appends extension and but it does not encode them. Virustotal analysis proves that it is a fake file-encrypting virus. It is detectable as Hoax.Win32.FakeRansom.an, Trojan.Ransom.Allcry, or Unwanted/Win32.FakeRansom.C2174. Thus, there is no need to waste time. Remove Allcry virus. Allcry demands 0.2 BTC, which is, approximately, $886, in exchange for the data. Considering the latter, it may arrive in emails which are supposedly sent by official Korean or Chinese institutions. Such emails will urge you to review the contents of an attached file as soon as possible. Most common “baits” are invoices, package delivery notices, and subpoenas. Instead, verify the sender and scan the extension with an anti-virus before opening it. Note that some viruses tend to wrap the malware with anti-sandboxing features. Thus, double-check before opening similar attachments. In addition, be wary of trojans and corrupted applications as well as browser extensions. Avoid 9installing unnecessary one, especially the ones which offer faster and safer browsing, but fail to deliver proper credentials of a responsible company. These tips will help you avoid Allcry hijack and similar ransomware intervention. Since it is not a genuine file-encrypting threat, you should not encounter many difficulties eliminating it. Remove Allcry virus with the assistance of malware elimination tool. In case you cannot get past the lock screen, click Alt+F4. If that does not help, boot the computer in Safe Mode. Below instructions will show how to do that. Then, you should be able to complete Allcry removal. Safe Mode will grant you access to vital system functions. Likewise, it should bypass possible Allcry intervention. Log in to your infected account and start the browser. Download Reimage or other legitimate anti-spyware program. Update it before a full system scan and remove malicious files that belong to your ransomware and complete Allcry removal. When a new window shows up, click Next and select your restore point that is prior the infiltration of Allcry. After doing that, click Next. Once you restore your system to a previous date, download and scan your computer with Reimage and make sure that Allcry removal is performed successfully. Guide which is presented above is supposed to help you remove Allcry from your computer. To recover your encrypted files, we recommend using a detailed guide prepared by 2-spyware.com security experts. If you encounter real file-encrypting threats, this tool might be one of the alternatives to decode the data. There is no need to pay the money since the Allcry malware does not encrypt files. Eliminate the ransomware. In case the files are locked, use alternative data recovery software. ^ CheckMAL. Allcry Ransomware (.allcry) Block Video. Youtube. Broadcast yourself. ^ show.exe. Virustotal. Free malicious URL analysis . This entry was posted on 2017-10-24 at 04:54 and is filed under Ransomware, Viruses. You can quickly scan the QR code with your mobile device and have Allcry ransomware virus manual removal instructions right in your pocket. How did you remove Allcry virus?